Want to see growth in your systems integration business? Listen up. Consider the particular applications that are ideal for ALDs (assistive listening devices): venues/rooms where it may be difficult for many people to distinguish speech from a variety of noises. Which applications require the technology for ADA compliance? 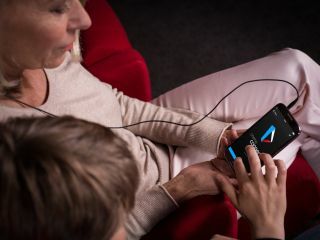 At Sennheiser, new versions of MobileConnect and CinemaConnect apps for accessible streaming allow users to not only adjust volume but also to adapt speech intelligibility and sound quality to their particular requirements. These features were developed in close collaboration with the Fraunhofer Institute for Digital Media Technology. Sennheiser is advancing the availability of assisted listening solutions for universities with its MobileConnect solution. By offering the ability to live stream audio via WiFi to a user’s own device, also known as Bring Your Own Device (BYOD), the system is ideally suited to academic institutions wishing to quickly and cost effectively enable access to education to hearing impaired students. The system’s ConnectStation is a streaming server providing near latency-free multichannel audio streaming over Wi-Fi in auditoriums, classrooms, theaters, and gymnasiums—wherever the campus Wi-Fi is available. The MobileConnect app makes the service intuitive to use and can also be tailored to a user’s particular hearing needs via the Personal Hearing Assistant, allowing users to adjust the volume and to adapt speech intelligibility as well as sound quality.